The Pobal HP Deprivation Index shows the level of overall affluence and deprivation at the level of 18,488 Small Areas (SAs) in 2006 and 2011 in Ireland. 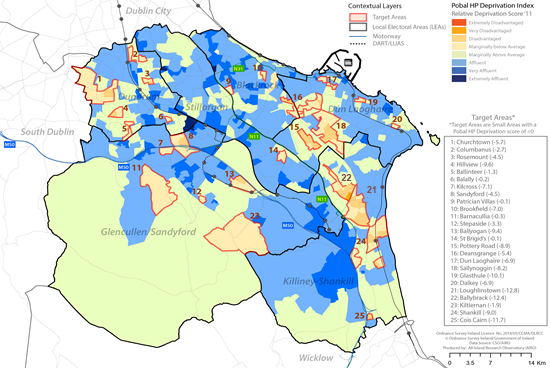 In total there are 37 SAs in Dun Laoghaire Rathdown classed as being ‘Disadvantaged ‘ and ‘Very Disadvantaged’, of which 19 experienced a negative shift in their relative position over the 2006 to 2011 period suggesting that these disadvantaged areas have gradually become increasingly excluded from other more affluent areas within the county. 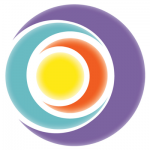 Southside Partnership has focused on developing a Targeted Area strategy for all SAs classed as ‘Marginally Below Average’, ‘Disadvantaged’ and ‘Very Disadvantaged’. This accounts for 101, or 13.2%, of all SAs (760) in the county. The identified SAs have been grouped into 25 Target Areas across the local authority area and now provide the Partnership with a clear evidence base for focusing on the most disadvantaged and ‘at risk’ of disadvantage areas in Dun Laoghaire Rathdown. The 2011 Pobal HP Deprivation Index shows that over 11,000 people in Dun Laoghaire Rathdown were either ‘very disadvantaged’ or ‘disadvantaged’. In addition, a further 17,000 people in the county were classified as ‘marginally below average’ and Southside Partnership is also concerned with supporting these communities to protect them from further hardship. In 2011, there were 28,480 people in our county that are experiencing poverty and social exclusion. There is evidence that the position of subgroups that were already disadvantaged before the recession has deteriorated at a faster rate than on average. In this sense, there is evidence of social inequalities widening for some population subgroups.